animals and birds which were included in the family of his youth. At age nine, Athos studied under Italian marine painter, Ugo Manaresi. Later, he served a three year apprenticeship to the famous Belgian muralist Charles Doudelet and eventually he studied at the Royal Academy of Fine Arts in Florence. painter to that of teacher and director of Davis Island in Tampa Bay. Upon moving to Atlanta, Georgia, he worked as a muralist. It was here that many of his works came to grace various southern mansions (as well as Robert Woodruff’s Ichuway Plantation in South Georgia) and public buildings such as Citizens and Southern Bank branches and the Capital City Club. He also painted murals for Atlanta’s leading architect Philip Shutze of Swan House owned by Edward Inman. 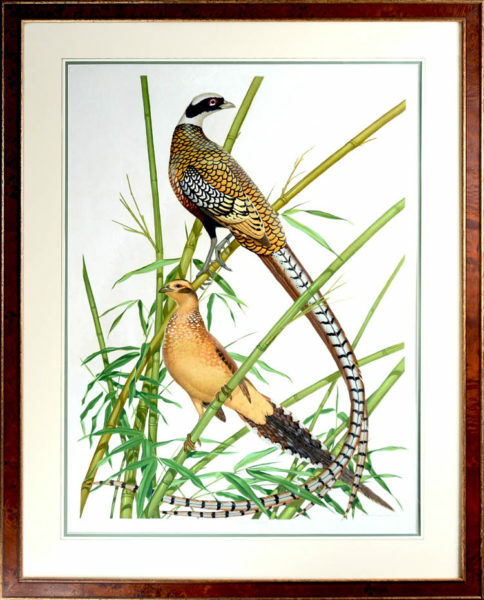 Fervently inspired by the work of John James Audubon, it was in the 1930’s that Menaboni casually experimented with painting birds, between commissions. Ultimately, it was this union of his painterly skills and reverent love of nature that gave birth to the realization of his greatest joy the quintessence of his art. Throughout his prolific career, Menaboni painted more than 150 species of American birds and landscapes. His paintings are found in notable collections such as those of the Callaways, Du Ponts, Marshall Fields, Ben Fairlesses, and Robert Woodruff of Coca Cola (including paintings for Woodruff’s Christmas cards for 44 years, between 1941 and 1984). His work is also to be found in the Seattle Art Museum, the Emory University Woodruff Library, and the Atlanta Historical Society and have been exhibited at the American Museum of Natural History and the National Audubon Society in New York. Amongst the honors awarded Menaboni’s art are: the Georgia 1983 Governor’s Award in the Visual Arts, American Institute of Architects, American Graphic Society, Daughters of the American Revolution, Atlanta Beautiful Commission, the New York Art Directors Club, the Italian Cultural Society, and the American Institute of Graphic Arts.